As I am sure most are already aware, the next iOS tablet from Apple is expected to hit in a few days time on the 7th of March, and the rumour is albeit unconfirmed as with most thing Apple before Apple unveils a new device is that the Apple iPad 3 will come with a Retina Display, and as such the question is what would a game such as Food Run look like on the iPad 3 Retina Display? Well according to the guys over at Book of the Dev, the developer of the Food Fun game wanted to find out what an Apple iPad 3 Retina Display would mean to his upcoming iOS game and how it would look, and apparently Food Run was built with the possibility of a 4x as many pixels than the previous iPad in mind. And so the developer delivered an image of existing art at iPad 3 Retina Display resolution, and thus here is a close up screenshot of the food in Food Fun as it would be on the Apple iPad and Apple iPad 2 if you were very close to the display below). Next we have the same close up screenshot, but this time it is apparently how the shot would look like on the Apple iPad 3 Retina Display, which shows quite a bit of difference such as the sharpness of the seeds on the bun and the crisp black outlines (below). And then the developer delivers an app icon comparing what an iPad app icon looks like close up now and what it would look like on the iPad 3 if the slate comes with that rumoured Retina Display and again shows that much more detail is retained when close up. Of course that’s all well and good, but we still don’t know for sure if the Apple iPad 3 will surface sporting that Retina Display, something we will all no doubt find out come next Wednesday. 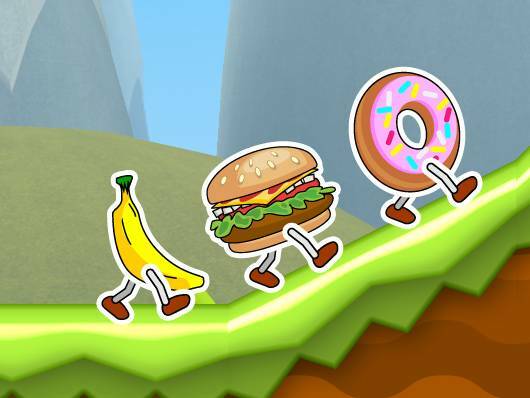 As for that Food Fun iOS game, there’s a video of the latest version below, which to me looks a great deal like Sonic the Hedgehog except using food.